It was 15 years ago when Claudio Abbado took the Berlin Philharmonic to Costa Mesa and left an indelible memory of that fabled orchestra’s brilliance and precision of ensemble that were second to none in the world. Last Saturday night, in a different venue and under a different conductor, the Berliners gave a déjà vu performance of undiminished power and brilliance more than a decade later. The historical significance of this concert cannot be overstated, as it revealed the Berlin Philharmonic’s paradoxical L.A. connections. For one thing, the orchestra must have felt right at home in the Walt Disney Concert Hall, designed by Gehry and Toyota in the same open floor-plan as the Berliner Philharmonie. Secondly, its chief conductor and artistic director Sir Simon Rattle was at one time principal guest conductor of the L.A. Philharmonic. And last but not least, Pierre Boulez’s Éclat that opened the program was commissioned for the 1965 opening of LACMA and played by 15 members of the L.A. Phil at UCLA, conducted by the composer. If there were such a thing as the Guinness World Record for accuracy and virtuosity of orchestral playing, the Berlin Philharmonic would be sure to take the cake, as demonstrated so effectively in Boulez’s 10-minute-long Éclat that still sounds as modern and avant-garde today as it did fifty years ago. The 15 musicians of the Berlin Philharmonic struck, strummed or blew into their instruments with the precision and finesse of a Swiss watchmaker, creating an otherworldly tintinnabulation of sounds evoking ‘The Twilight Zone’. Two of the instruments – the guitar and the mandolin – would also be heard later in the Mahler Symphony. Mahler liked to call his large-scale symphonies “an entire world in a nutshell”. Unlike Bruckner’s symphonies, spirituality and emotional restraint are not Mahler's calling cards. Mahler’s Symphony No. 7 may not be an entire world unto its five movements, but rather it is an entire half-day from dusk to dawn – from the shadowy, sometimes frightful music of the first four movements to the brilliant flashes of light in the finale. 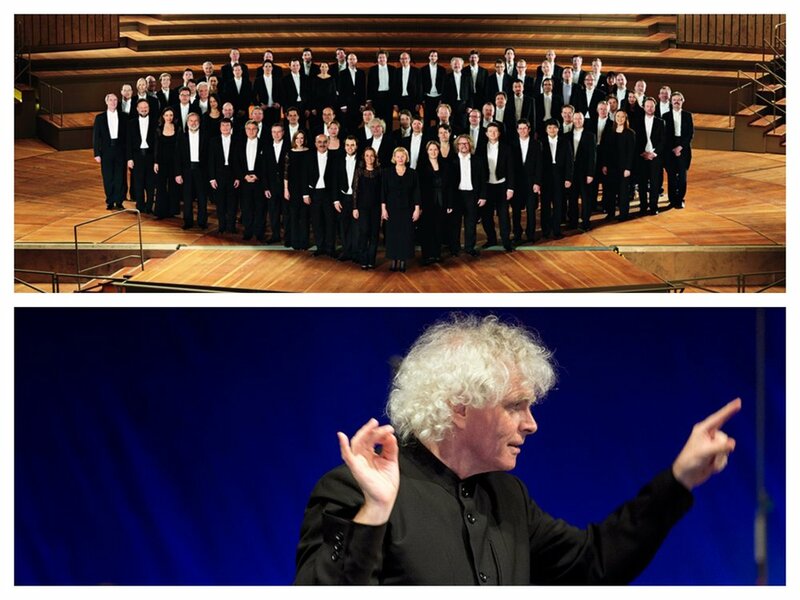 In his final season as chief conductor before stepping down in 2018, Sir Simon Rattle pushed the orchestra hard with brisk, often punishing, tempos, and the orchestra responded with overwhelming drive and brio, producing not only blazing accuracy and virtuosity of ensemble playing, but also white-hot emotionalism in the two Allegro movements, as well as chamber music-like finesse and charm (albeit with a heavy doze of earthy humor and sarcasm) in the Scherzo and two Nachtmusik sections. The Berlin Philharmonic proved itself not just a coldly efficient, well-oiled machine, but a full-blooded body of musicians all striving for, and sometimes achieving, perfection. The Berlin Philharmonic will make its final U.S. tour stop in San Francisco on Nov 22, 23 before returning to Germany.